Midway between performance and audiovisual installation, this work is a collective and interactive experience in telepresence. 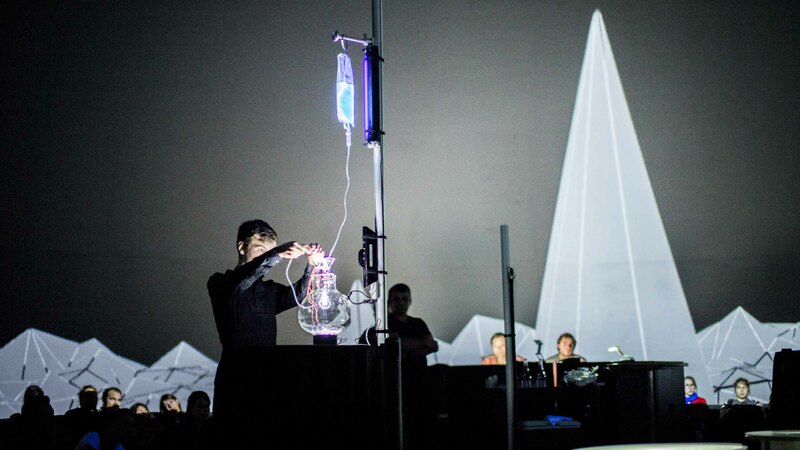 Audiences at the Society for Arts and Technology (SAT) in Montreal (CA) and Festival Maintenant in Rennes (FR) simultaneously participate in the creation of an audiovisual work in real time. 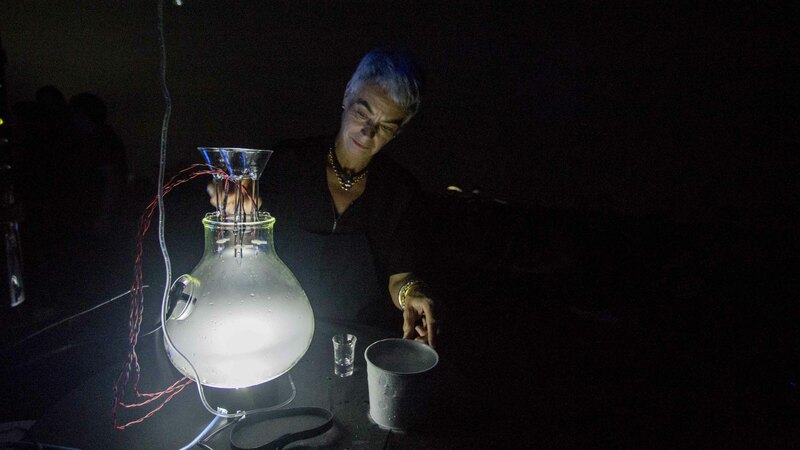 To create the work, they manipulate a multimedia device comprised of liquids and equipment from a science laboratory. Manuel Chantre and Mathieu Le Sourd alias Maotik seek an innovative approach to telepresence, giving it a sensory dimension and providing an experience that transcends current modes of communication. They developed the project with two chemistry researchers and an electronic engineer from the University of Rennes1 as well as a team of researchers at the SAT. The work’s main thread is the virtual rapprochement of the two locations. As the performance proceeds, audience actions in Rennes and Montreal converge and gradually intensify until perfect homogeneity—or miscibility—has been achieved. In chemistry, miscibility is the ability of one liquid to mix with another liquid homogeneously. 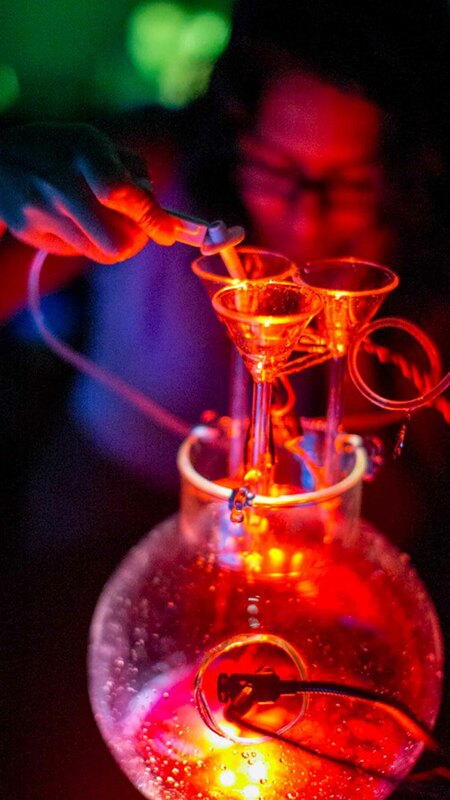 Technique : Each location requires 3 made-to-measure glass chemistry jars, 9 infusion bags and 3 infusion bag stands, liquid (carbonic ice, water, citric acid, sodium bicarbonate, quinine) Wifi network, 1 network computer (with the SAT’s Scenic software, acquisition video card, 2 audio channels), 1 generative visual computer, 1 audio computer, 6 circular video projection screens, 1 video projection dome or screen, video projection system A for the circular video projection screen, video projection system B for a video projection screen or dome, 3 tables, 3 microphone, 4 to 150 speakers for ambiophonics sound, 1 mixing console, 3 ultraviolet lights, 3 microcontrollers and electronics, 3 video cameras, audio software, visual software and multimedia software. Credits: This project was a production of the cultural service from the University of Rennes1 and of the Society for Arts and Technology (SAT) as part of the crossed residencies program.Researchers and students from the ESIR (University of Rennes1) have contributed to the project, as well as researchers from the Metalab at the SAT. 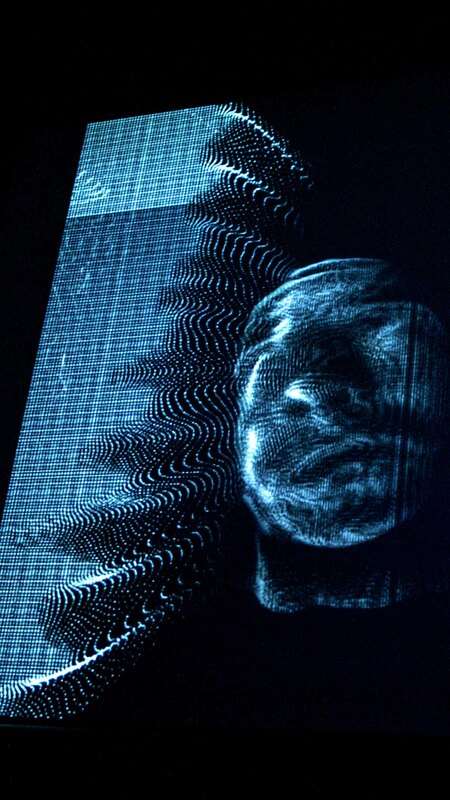 They have developed the Scenic technology which is used for the artistic telepresence. Montreal Team : Manuel Chantre, artist from Montreal, Patrick Bauchat, teacher and researcher at the the University of Rennes1, Michal Seta and Nicolas Bouillot, Scénic developers at the Métalab. Rennes Team : Maotik, french artist, Ludovic Paquin and François Lemercier, teachers and researchers at the the University of Rennes1, Thierry Pain, glass-blower.Presented as part of the exchange program SAT Contamine. A collaboration between the Society for Arts and Technology [SAT] and the Cultural Service of the University of Rennes1 with the support of Rennes Metropole, Fonds franco-québécois pour la coopération décentralisée (FFQCD), Ministère des Relations internationales et de la Francophonie du Québec and the city of Rennes as part of Opportunités Digitales and the festival Maintenant.